Where Have All The Buffalo Roamed? 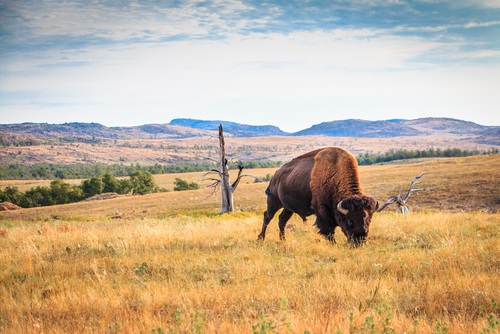 Approximately 30 million buffaloes used to roam America's grasslands. What happened to them? 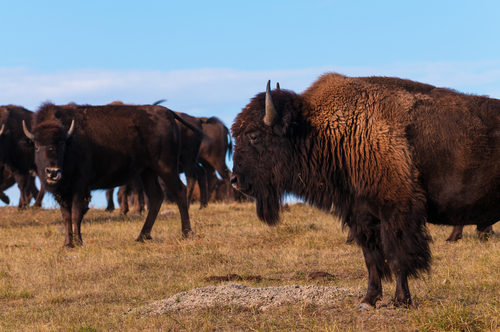 Oh, give me a home where the buffalo roam — but wait, are buffalo extinct? Some historians believe that as many as 30 million buffaloes once roamed North America from 1600 to 1870. So, where did they all go? Today, there’s little to no risk of discovering that your hometown has been replaced by a carpet of roving buffalo herds. There are approximately 530,000 buffaloes on private and public lands, and roughly 15,000 in the wild. Also, not to burst your bubble, but the American buffalo is not technically a buffalo. They’re bison. Let me explain. The American bison is commonly known as the American buffalo, even though buffaloes are an entirely separate species. The only real buffaloes are the African buffalo, which is found throughout the continent, and the water buffalo, which is found in Asia and Europe. So, every time you sang about buffaloes in “Home on the Range,” you were singing about lies. Now, before you start quaking under the cold hand of the truth, know that there’s a ton of speculation to explain the origins of this misnomer. The Greek word “bison” means ox-like animal, and French fur trappers may have used the word “bœufs” (ox) to describe these huge animals. Alternately, the word “buffe” or bufle” once was used to describe any animal whose hide could be used for buff leather — so, essentially, the name “buffalo” could have come from anywhere. For a better idea of just how diverse the word "buffalo" truly is, check out this grammatically correct sentence in American English: "Buffalo buffalo Buffalo buffalo buffalo buffalo Buffalo buffalo," which uses three distinct meanings of the word. Crazy! What Is An American Buffalo, Anyway? Even though they’re technically bison, we’ll refer to these animals as buffaloes because the name is more widely recognized. The American buffalo is a heavy, short, hairy animal that loves to graze with its large, low-hanging head. The widely-spaced position of its horns means that the American buffalo prefers to charge its enemies, which is way more brutal than the European buffalo, which fights by interlocking horns. Despite weighing up to 2,205 pounds, American buffalo can jump close to 6 feet in the air. They can run 35 to 40 mph. For the sake of comparison, Greyhound dogs can run 45 mph. Early attempts to domesticate the buffalo failed because of their “wild and ungovernable temper,” which is super inspiring — you can’t tame that buffalo spirit. And then, of course, the 19th century happened — and expanding European-American populations made the American buffalo all but extinct. Between 1867 and 1884, new railroads made it relatively cheap and easy to transport buffalo hides and other materials. So, hunters flooded the market. They slaughtered a staggering four to five million buffaloes in just three years. The table below illustrates just how much the buffalo population has changed over the past few centuries. Today, conservation efforts have brought buffaloes back from the brink of extinction: the largest wild herd (2,500) roams the grasslands of Yellowstone National Park. There's even a thriving buffalo population in San Francisco's Golden Gate Park! One of the largest takeaways from the near-end of the American buffalo is this: overhunting can have serious ecological effects, and it's an issue that we continue to grapple with today. After all, 95% of modern buffalo live on private lands, where they are raised for meat. The phrase “ecological actors” refers to the symbiotic relationship between grasslands and grazers, like buffaloes and cows. 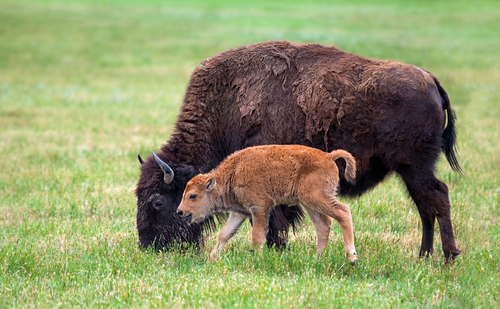 In a symbiotic relationship, two organisms rely on each other to survive — which means that buffaloes play a crucial role in maintaining the natural health of North America’s landscape. Across semi-arid regions of the continent each year, grasses produce roughly one-third more growth than will naturally decompose. That excess grass chokes the soil, which prevents healthy plant growth. Grazers eat that excess grass, and their hooves help bury seeds and aerate the soil. In short, the American buffalo represents our history, our near-mistakes, and the continued work of conservation efforts across the continent. Celebrate the American buffalo! "Every time you sang about buffaloes in 'Home on the Range,' you were singing about lies."